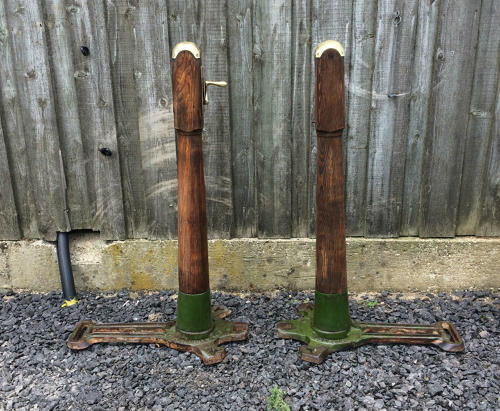 A rare and attractive pair of tennis net posts with winder, dating to the Victorian period. The posts are made of quality pine and are stained to give a dark wood finish. The post tops have brass caps and the winder has a brass handle. The bases are made of cast iron and have the makers name M. GARDINER Ltd, HODDESDON and HERCULES cast in to each base. The winder mechanism, Bezewynder, is fully working and the heavy cog is visable. The RD number, 629225 is stamped in to the plate holding the winder. The posts have a fantastic vintage look and are heavy and solid. The posts detatch from the cast iron bases for easy transportation. The posts are reclaimed, antique items, and therefore has some small signs of use and wear. There are some marks and scratches on the brass tops of the posts and there are some slight scratches and marks to the wooden posts. The cast iron bases have some surface rust. The posts are fantatsic vintage items that have a very desireable look. Rare and useable sporting items.